Content has undergone a dramatic change in the last 2 years. It used to be just about keywords – the text had to contain enough of your keyword so that Google could recognize whether they were present or not. However, the search engine is getting better and better at rating content. The algorithm works semantically. It uses stemming and recognizes what content users like based on their behavior. Anyone who wants to be at the top of the SERPs therefore needs to provide their users with high quality content. The best way to do this is with an effective content strategy for your website. Why have a strategy at all? I can just create content and put it online, can’t I? Yes, and with a bit of luck, you’ll get good rankings – but for how long? Content creation is a long term strategic task, and is therefore a process that will never end. Your competition isn’t sleeping, and users are critical. If you know what your users like and what the competition is up to before you start creating your content, you will not only become a champion, but you can retain your status too! 1. The audit – how good is my content? How easily are users finding your content? How much do the users like it? Enter all the URLs of your domain and their respective keywords. Determine the rankings of the keywords for which your pages are to be found; you can do this with the Google Search Console. 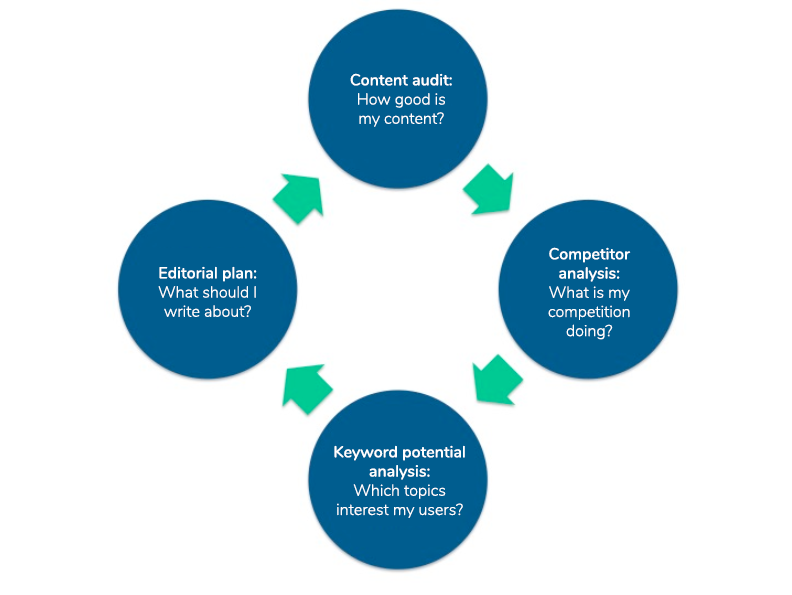 Identify the key KPIs that you can use to evaluate your content. These can include bounce rate, length of visit, social signals, backlinks, clicks and impressions. The bounce rate is an important quality factor, but you should always scrutinise it. If it is high, that does not necessarily mean that your content is bad. Maybe the user has found what they were looking for on your website, and therefore don’t need to click on any other pages. This especially applies to purely informative content that is meant to provide the user with answers to their questions, such as a magazine article. Therefore, a high bounce rate can also be a positive sign. The time on page tells us how much time the users have spent on your content. However, a short visit is not necessarily a bad thing. It depends on the content. If it is a distribution site, a long dwell time is not what you want. Instead, in this case a short visit with a high bounce rate would not be negative. Social signals are direct ratings of your content by users. You should always give your users the opportunity to like and share your content on social media. You should also actively share it yourself on different channels. Backlinks are another means of evaluation by users. You can also promote the number of backlinks by contacting other webmasters and bloggers and asking them to link to your content. If you are providing valuable content that is worth linking to, they will be happy to do that. The clicks and impressions show you – together with the rankings – how successful your content is in the SERPs. How often is it displayed on Google and how often is it actually clicked? If it ranks well but is rarely clicked, you should take a closer look at your snippet. Does it encourage clicking? Is it informative enough? Take a closer look at the click depth. Maybe your content is performing poorly because both user and the Google bot can’t find it easily. Content that ranks well and does not need to be edited. Content that does not yet have a good or bad ranking, but has potential and needs to be updated. Content that has a low ranking, is too watered down or is too old and therefore needs to be deleted. 1. Keyword check and optimization using a TF*IDF tool (see more about that below) in order to improve rankings. Using TF*IDF to optimize your content achieves fast results. 2. Content revision, if the analysis results show that users don’t like your content. 3. If your snippet is not clicked on and yet you have a page 1 ranking, albeit not in the top 3 results, click optimization can help: Include ASCII characters like check marks or hearts in your snippet. Rich snippets increase users’ attention and encourage them to click. Also check the wording in your snippet. 2. Competitor analysis – how far ahead are the others? If you want your content to be a champion in the SERPs, it’s worth taking a look at what the competition is doing. This will let you see which keywords might be of interest to you and which content works well. It’s not about recreating or even copying the content, but more about inspiration and getting to know the market and target audience. First, take a look at the content. What areas of content do the competitors have? Which content types and topics do they use? Do they have directories or individual landing pages with holistic content? Next, take a look at the performance. How visible are the respective website or content directories? For which keywords do the competitors rank? For which keywords do they rank better than you do? If competitors have better rankings for the same keywords, take a closer look at their content: What do they have that you don’t? Possible new topics can be derived from this analysis. 3. Keyword potential analysis – for which keywords should I produce content? Now that you know what keywords you’re already ranked for and what your competitors are doing for their content, the next step in your content strategy is to conduct an analysis of what new topics are of interest. First, collect keywords for which you would like to create content. Look for possible topics in forums, communities and on relevant portals. 1. Using the Google AdWords Keyword Planner, you can look up the average monthly search volume of certain search terms, which will show you how high the user interest of these terms is. You can then use the Planner to choose from several synonyms / terms that users will find most interesting. These then give you your topic or the focus keyword to which you then align your text with. The Planner can still give you keyword ideas that match your entered terms and can also be interesting if they have a high search volume. 2. Using a long-tail keyword tool, such as keywordtool.io, you can research other relevant words and phrases related to your focus keywords, or you can enter a keyword and get phrases that users are looking for. Collect all the keywords in an Excel sheet. You can create a separate one or you can add on to your sheet by entering the keywords for which your website is already ranking. Group the keywords according to subject matter. This will immediately provide you with keyword sets containing focus and secondary keywords, which you can later use to adjust your texts. For the final step of your keyword research, use a TF*IDF tool. 4. With a TF*IDF analysis, such as that found in the module RYTE Content Success, you can research keywords that will make your content more relevant for your focus keyword. Google expects you to have text for a specific topic and to increase the relevance of your text for the search. As mentioned above, you should also use a TF*IDF tool if you want to revise your content and improve rankings. In Ryte’s Content Success, you can compare the content of your URL to that of the current top ranked results on Google. You can see immediately which words / phrases you should add. Using the text assistant, you can customize your content and see in real-time whether you need to revise the content more, or if something is still missing. 4. The editorial plan – when do I create which content? To do: Creation, revision, click optimization, etc. The content type: Points page, guidebook, blog post, infographic, etc. The keyword function: Here you enter whether it is a focus, secondary, relevance-enhancing or a Wh-question keyword. Content for which you can define the key points. 3. Prioritize the topics based on the search volumes of the focus keywords: The higher the search volume, the higher the chance that more users will come to your website and it will become more and more popular on the web. Once you are well-known, users will come all on their own (again). Later, you can tackle topics that are of less interest to the users. 4. You should set up a monitoring system to always know just where your content stands. To do so, you check the keyword rankings and other KPIs as described above in the audit, so you can continuously improve your content. Content creation is an ongoing process. You have to stay on the ball if you want to remain the champion for a long time to come. The SERPs also change over time, so you’ll have to make adjustments over and over again, and make sure you keep monitoring the SERPs. Try to always create the highest quality content possible, and don’t try to make up just any old content. Users don’t have to visit your website – there are lots of other options for them. Write properly, truthfully and keep it current! You should address your target group in a manner that is both pleasant and appropriate, and how to do this will depend on your subject matter! Write as much as necessary and as little as possible – you do not have to create unnecessarily long texts. Structure your text so that it is easily scannable, and offer the user reading guides such as subheadings, tables, bulleted lists, and pictures! Explain your topic verbally and visually: Use photos, graphics and videos! If you stick to this content strategy checklist, your content can become a true SERP champion! Published on 05/22/2018 by Beatrice Isgró. Dr. Beatrice Isgró is Head of Content at eology GmbH and, as a linguist with a doctorate, combines the topics of language and SEO. Her aim is to make complicated things understandable and appealing. She advises clients in the areas of content strategy and conception, manages online editorial projects and enjoys passing on her knowledge to customers and employees.